Minneapolis Fire Department (MFD) covers 59.7 square miles with a population of 382,618. It has a budget of 50 million, 424 sworn members, and 19 stations that consists of 19 engines, 5 ladders and 2 heavy rescues trucks. The function of the MFD Engineering Officer is to be a liaison between city departments. One of these departments is the Minneapolis Public Works where the Fire Repair Shop is staffed. The facility is located near downtown. It has five bays for fire with five full time mechanics, one travels station to station to perform quick repairs while the other four work at the shop on longer term repairs and major Preventive Maintenance (PM) work. The shop is managed by an Equipment Repair Foreman. The Engineering Officer position involves working with the Fire Shop Foreman on such things as rig specifications and acceptance of new rigs, modifications, installation of tools, officer vehicle build, repairs, maintenance, etc. The two different city departments work well together. What makes this relationship work so well is that the Engineering Officer relies on the Shop Foreman to know not only the maintenance of the rigs, but also the operation of the equipment and the department. In turn the Shop Foreman relies on the Engineering Officer to know the shop functions and have a keen understanding of the operation, maintenance and repairs of the fire equipment. Minneapolis Public Works, Fleet Services Division views Fire, Police and support of snow removal equipment as their main functions and responsibilities; and in that order. This relationship proved itself the evening that the 35W Bridge collapsed…..
Fire Shop Foreman Cam Haugland was at home helping a neighbor; Engineering Officer Walt Lee was in Chicago on business. 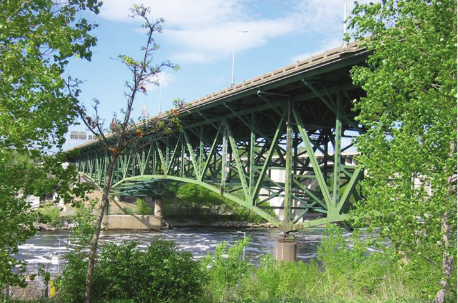 A page when out as a “probable structure fire” at 500 2nd St. SE……then all hell broke loose as the call was quickly change to a bridge collapse on 35W near the University of Minnesota. MFD rigs were rolling. The Incident Commander arrived on the top of the 10th Ave. Bridge, just down river looking upstream at the 35W Bridge collapse and requested all units be dispatched. One rig was left in each of the four districts and the rest dispatched to the scene. 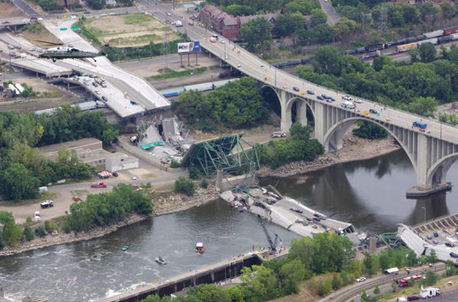 The I35W eight-lane Mississippi River bridge in Minneapolis, Minnesota before the collapse. Everyone on scene knew that because of the rush hour traffic, the number of victims in the water could be in the hundreds. Captain Lee contacted the Command to let them know he was aware of what was happening and available. He then contacted Cam to start arranging what might be needed. For the next 20 minutes Capt. Lee was in contact with the Incident Command for what they wanted/needed and passed information along to Cam. Then the cell lines went dead. This is where the close relationship between Fire and Public Works proved itself. When the cell phone towers overloaded and Captain Lee lost contact with both Incident Command and Cam at the repair shop, Cam started to ready all the spare equipment. Not being able to contact Captain Lee, Incident Command now had to work directly through the repair shop for equipment staging and placement to cover station operations. Shop staff helped deliver rigs and SUVs to outlying stations for the “called back” MFD staff. Crews reporting to stations close to the shop drove to the staging area that had been set up at the repair shop campus and picked up their rigs. The shop staff also staged and delivered to the scene Public Works equipment such as a cable crane, crawler hoe/thumb, fuel truck, and tow trucks. Because Incident Command was inundated with calls, they forwarded the calls from equipment rental companies to the shop. Equipment, such as light towers, generator sets, etc., was staged at the repair shop campus. As equipment was needed it was deployed and escorted through traffic to the bridge collapse scene. The operation seemed to work seamlessly because of the “working relationships” between departments. Much credit is due to the National Incident Management System (NIMS) training that the City of Minneapolis has provided to all departments. With Fire, Police, and the Sheriff Departments handling the actual collapse scene, many other City of Minneapolis Departments were set into action. Street Department delivered barricades and helped set up traffic diversions at the direction of the Traffic Department. The Bridge Department was on the river with their boats to assist as needed. Other departments were also critical in the operation that continued the next few months. The last survivor was transported from the site 2 hours after the initial call. Captain Lee arrived two days later and assisted in logistics. Do not have people and equipment self deploy. Stage excess people and equipment at a remote site. Do not rely on cell phones, towers are overloaded quickly. Spare equipment plays a key role in a major incident. Major incidents have a short duration. Good relationships between departments are important. NIMS training for all city departments was key in them all the working together. Document everything as soon possible, FEMA documentation, cost, etc. Captain Walt Lee, 21 years with Minneapolis Fire, the last 11 years as Engineering Officer. Cam Haugland, 21 years with Minneapolis Public Works, Fleet Services Division, the last 7 as the Fire Shop Foreman. 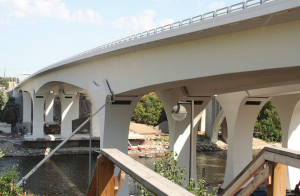 The new Interstate 35W bridge in Minneapolis has opened just a little more than a year after the last one collapsed into the Mississippi River. The new bridge is concrete instead of steel and is built with redundant systems so that if one part fails, it won't collapse. The 234 million dollar project was completed on budget and more than three months ahead of the December 24 deadline.